The Rt Hon Sir Tony Baldry MP has been appointed by the Archbishops of Canterbury and York to become the next Chair of the Church Buildings Council when he stands down as Second Estates Commissioner at the end of this Parliament. He succeeds Anne Sloman OBE. Following an open advertising process, Sir Tony was selected to become the next chair of the Church Buildings Council, the statutory body providing advice to General Synod, chancellors, Diocesan Advisory Committees and others on all matters relating to the Church of England’s 16,000 church buildings. In recent years the focus of the member level body and of the staff team supporting it has shifted to put greater emphasis on national campaigning and on promoting and producing more materials and resources of direct benefit to parishes. Sir Tony will take up the role in April 2015 at the end of the current parliament, after announcing on September 1st that he will not be seeking re-election as a member of parliament. He has served as a member of parliament since 1983 with a number of ministerial roles. In 2010, Sir Tony was appointed as Second Church Estates Commissioner, with responsibility for answering questions in the House in a manner similar to questions to ministers on the work of the Church Commissioners. 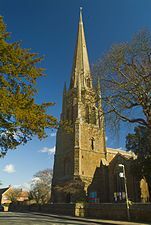 “Sir Tony is committed churchman and supporter of his local church St Mary’s Bloxham in the diocese of Oxford. He has been an outstanding Second Church Estates Commissioner and a former minister who knows his way around Whitehall.